A new coalition of civil liberties and digital rights groups has formed in response to the Trump Administration’s “extreme vetting” which requires travelers to give up social media passwords. 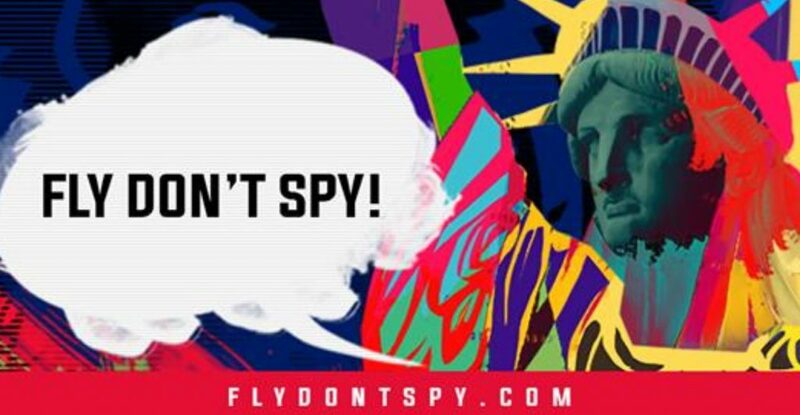 In response to the growing trend of forcing travelers entering the United States to share their online passwords, 29 organizations have formed the “Fly Don’t Spy” coalition. The coalition is made up of civil liberties, digital rights, and privacy organizations from around the nation, including the American Civil Liberties Union, Electronic Frontier Foundation, and the Electronic Privacy Information Center. The new group is opposing the Trump administration policy of requiring travelers to give up their sensitive information, including passwords, in order to enter the United States. They have launched FlyDontSpy.com and have begun circulating a petition that will be presented U.S. Department of Homeland Security (DHS) Secretary John Kelly asking him to oppose “password for entry” schemes. In early February, Secretary Kelly told the House Homeland Security Committee that the DHS is considering various forms of “extreme vetting,” including forcing visa applicants to provide passwords to social media accounts. In response to questioning by Senator Claire McCaskill in the Senate Homeland Security and Governmental Affairs Committee on May 5th, the Secretary stated that only a limited number of travelers would be impacted. However, DHS is currently expanding a program to ask travelers to hand over their social media accounts voluntarily. In anticipation of more “password for entry” plans, the Fly Don’t Spy coalition is issuing a call to action. “Even if you support ‘extreme vetting,’ password for entry is an extremely bad idea that sacrifices privacy and digital security for political posturing and ‘security theater’,” said Nathan White, Senior Legislative Director at Access Now. The full roster of the FlyDontSpy.com coalition, led by Access Now, includes Advocacy for Principled Action in Government, American Civil Liberties Union, Asian Americans Advancing Justice LA, Association for Progressive Communications, Brennan Center for Justice, Center for Democracy and Technology, Center for Media Justice, Committee to Protect Journalists, The Constitution Project, Daily Kos, Defending Rights and Dissent, Demand Progress, Duck Duck Go, Electronic Frontier Foundation, Electronic Privacy Information Center, Fight for the Future, Free Press, Freedom of the Press Foundation, The Identity Project, Immigrant Legal Resource Center, Media Justice League, National Immigration Law Center, New America’s Open Technology Institute, Open Media, Pen America, Restore the Fourth, T’ruah, and Wickr Foundation. The Fly Don’t Spy coalition is not the only group fighting the encroachment on privacy taking place at the border. The Anti Media recently reported that four members of Congress have introduced legislation that would require border agents to get a warrant before performing a search of someone’s cell phone, laptop, or tablet. The bill was simultaneously introduced by Senator Ron Wyden and Representatives Jared Polis and Blake Farenthold. If the measure becomes law, it will require border agents to have probable cause and a warrant before accessing the contents of a device belonging to a U.S. citizen or permanent resident. The bill also makes it clear that agents cannot hold individuals for more than four hours in an attempt to force them to unlock their devices. In early March, NBC News highlighted the rise in violations of basic rights, including an increase from 5,000 warrantless searches in 2015 to 25,000 in 2016. This data from the Department of Homeland Security also shows that an astonishing 5,000 people were searched along the border in February 2017. Earlier this year, it was reported that the White House is exploring the possibility of scanning the social media accounts of all incoming visitors to the United States. President Trump’s rhetoric and ramping up of police state measures in the name of fighting illegal immigration has set the tone for policing along the border. The new bill could potentially slow down the march towards a totalitarian border, but ultimately, it will take the people standing up — together — to fight against tyranny. We should be wary of those who attempt to sell security at the cost of liberty.